You know that you're officially a grandma in life when you cannot hang at your own Memorial Day backyard party longer than the older peeps, hah. I'm typing this blog post as "Turn Down For What" is blasting from the outdoor speakers of our newly renovated backyard pool and patio, yet for some reason I rather edit photos for Instagram and write a blog post than chug down alcohol bottles. Meh, I guess I'm finally growing up, LOL. But since I have a bit of free time before the work week starts, I thought I'd share with you guys my eventful Memorial Day recap in a diary format because this was DEFINITELY a relaxing and productive weekend that I've been needing for a long while. Read below if you want to learn more about my eventful weekend featuring Marisa's bachelorette party at Glen Ivy Hot Springs and a fun backyard party featuring MilkAndEggs ingredients! Honestly, all I can remember from this day was probably ending work around 5/6PM, hitting the gym at night to work on "leg day", then running 2-3 miles around the neighborhood at night. Let's just say my legs felt like jello the next day, just in time for Marisa's bachelorette party. Awesomeeeee. Finally, the day we've all been waiting for - it was BACHELORETTE PARTY TIME! ;) For Marisa's bachelorette party, we headed to Glen Ivy Hot Springs for an entire day of rest and relaxation. If you guys haven't tuned into my Instastories, I am in absolute awe of this hot springs location. The first time that I visited Glen Ivy Hot Springs was for a fun collaboration, and I brought Sharon with me to get 50-minute Aromatherapy Essentials massages - you can read all about that experience here. To start the day, I arrived at Marisa's house at 7:45AM sharp and her family and I carpooled to Glen Ivy Hot Springs. Man, were we tired, but the entire experience was so worth. Marisa's mother-in-law rented a cabana for Marisa's entire bridal party (this includes me!) to relax in for the entire day, which is pretty much a private and exclusive area to dine and chill in. From our cabana, you also receive a picturesque view of the entire hot springs. If you're curious about what the cabana life is like at Glen Ivy Hot Springs, I left all of the behind-the-scenes, which includes a tour of Glen Ivy Hot Springs, in the HIGHLIGHTS REEL of my Instagram account, @missmisschelle, under "BRIDESMAID". Also, when you rent a cabana, you get to skip ALL the lines that a typical customer has to wait in - this includes checking-in at the entrance and waiting for food in an assembly line fashion. Talk about a "fast pass" type of experience! When it came to ordering food, can I just say that their mountain of nachos is ADDICTING AF?! I could literally wipe out an entire nachos bowl, I'm not even joking. Meal-wise, I ordered a Turkey Avocado Sandwich & a Berry Smoothie...honestly, I wouldn't recommend the sandwich, but the smoothie was bomb! I wanted to order a second smoothie after devouring my first, but decided against it since I thought I should try other things on their menu. Later throughout the day, I ended up ordering a Coffee Frap from their Starbucks and a Chocolate Brownie Froyo that the employees served to us at our cabana. Seriously love the cabana life! Regarding my Glen Ivy Hot Springs experience, Marisa's bridal party first visited Club Mud, which is popularly known for exfoliating your skin. First, you apply wet mud to your body, then sit in a heated room to allow the mud to dry before washing the mud off in their outdoor showers. Although it's strongly advised to wear a dark-colored swimsuit in the accidental case that mud won't wash off your swimsuit later on, oblivious Michelle ended up wearing white - goddammit Michelle. After Club Mud, we went to The Grotto - now THIS part, I loved. Essentially, an employee uses a "paintbrush" to apply a warm mixture of aloe vera, coconut oil, eucalyptus, and lavender masque to your entire body. Also, this mixture can instantly wash off your swimsuit so phew, I was saved there. Not only does it smell amazing, but the mixture feels SO relaxing when applied to your body. Similarly to Club Mud, we sat in a heated room to allow the mixture to dry on our skin before washing it off. The Grotto is meant to soften and hydrate your skin in a very therapeutic and interactive way. Lastly, we ended our Grotto experience by sipping on hot Tazo tea (we all loved the flavor orange!) while chatting the day away. As soon as we left The Grotto, we all went separate ways temporarily to head to our appointments. I received the Aromatherapy Essentials massage from a massage therapist named Robin, and she was absolutely AMAZING. I would definitely book with her again the next time I visit Glen Ivy Hot Springs! To make my Sunday morning productive, I went to the gym at 9:00AM and got "arms/chest" day over and done with for one hour, followed by cardio on the treadmill for another 30 minutes. With my Dori-like goldfish memory, I can't seem to remember too much of what happened after the gym. Honestly, I think I just took it easy, but I made a HUGE effort to stay away from electronics since I do a bunch of social media work on the weekdays. One thing that I DO want to start enforcing is putting away my phone anytime between the hours of 8-10PM and afterwards. Not only has a friend told me, but I noticed that I sleep like a baby much easier when I don't stare at the screen too close to bedtime. Also, I started reading a book called "Sleep Smarter" by Shawn Stevenson, recommended by a close friend and I absolutely enjoy it so far! Nowadays, I'm going to do my best to read every day for 30 minutes before I go to sleep - please feel free to keep me accountable ;) And truth be told, I woke up today feeling SUPER energized and refreshed, all thanks to putting away my phone earlier than usual. Lastly, if you have any book recommendations, please send them my way as well! 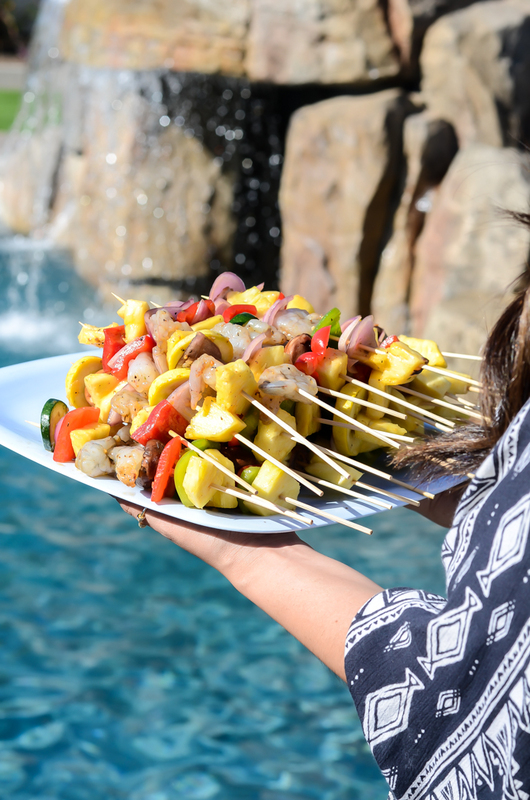 Since this morning, I whipped up a BUNCH of recipes using my favorite MilkAndEggs ingredients - this includes Shrimp Ceviche and Shrimp Skewers. If you're looking for the bombest homemade Shrimp Ceviche recipe, read my previous recipe blog post here. Just a quick reminder for those who don't know what MilkAndEggs is, it is an amazing grocery delivery service located in OC/LA that I've been using for several months now. Honestly, I have NO complaints about their and always rave about their business to my family and friends. MilkAndEggs literally takes the work and time away from grocery shopping by delivering quality and fresh ingredients to your doorstep whenever you want it! Essentially, my family and I had an intimate Memorial Day backyard party with homemade entrees prepared from MilkAndEggs ingredients to celebrate our newly renovated backyard. Honestly, our pool gives me "mini Disneyland" vibes, as the design looks very similar to the pool located near the hotel in Downtown Disney. In our backyard pool, we included a handmade rock slide (literally, the rocks were made of cement and sanded down to look like real rocks!) and added salt water to our pool to give it that beautiful and natural blue water effect that you can only find in Hawaii. And of course, what's a pool party without awesome FLOATIES? ;) Also, I'm absolutely loving our backyard setup because now I have a sweet location to shoot more product & food shots from the comfort of my home, heh.